A prime suspect in the disappearance and almost certain murder of former Teamsters union president Jimmy Hoffa, Anthony Provenzano, often referred to as Tony Pro, had strong organized crime support from the start of his career in labor. One of Tony Pro's early sponsors was Tony Bender, a longtime associate of Vito Genovese who controlled much of the rackets along the New York and New Jersey waterfronts and, in connection with these, ran a number of Teamsters locals as well. Provenzano was installed as a shop steward in a trucking company in 1945, and, by 1950, Bender had moved him along to become organizer for Teamsters local 560 in Union City, New Jersey. Bender was known to have used longshoremen to smuggle heroin into the country, and federal authorities long believed that Provenzano was deeply involved in narcotics trafficking. Over the next several years Provenzano's rise continued in the Teamsters; he became president of Local 560 and a vice president of the International. Even when Tony Bender disappeared permanently— undoubtedly killed by order of Vito Genovese, behind bars at Atlanta penitentiary—Tony Pro had a clear run. He had become very important both to the mob and his local; others he controlled became the hubs of various organized crime activities. Tony Pro oversaw bookmaking, numbers and loan shark activities run by his business agents and shop stewards. Even more lucrative was the widespread, often blatant pilferage of cargoes being trucked through New Jersey. Without a pass from Tony Pro no shipment could be considered "safe," and the price was not cheap. This was demonstrated by the successful prosecution and 1966 conviction of Provenzano for extorting $17,000 from a trucking company. One of the witnesses slated to testify against Tony Pro had been Walter Glockner but he was gunned down and killed. Still, there was enough evidence against Tony Pro; he was sent to Lewisburg federal penitentiary in Pennsylvania where he did four and a half years. In the prison he served as a prison capo under the boss of that institution, mob leader Carmine Galante. It cannot be said that Provenzano had a hard time there, being more or less in charge of assigning cons to some of the prison jobs. Informer Vinnie Teresa, upset at the 15 minutes of daily backbreaking labor spent cleaning a yard area about 10 by 20 feet, told Provenzano he wanted something easier. Provenzano assigned him to radio duty. His work each morning before breakfast consisted of pressing a button that turned on the radios in the cells throughout the prison. That finished the work for the day. Tony Pro assigned someone else to turn the radios off at night. When Provenzano finished his term he returned to his union duties, where no major opposition now existed. Back in the late 1950s and early 1960s there had been some opposition, but the rebels were seriously injured on two occasions, and several were targets of bombings and shotgun blasts. The last important opposition to Tony Pro was Anthony Castellito, secretary-treasurer of Local 560, who announced plans in 1961 to compete against the mob leader for the presidency. That June after a union meeting, Castellito, like Jimmy Hoffa later, was seen getting into an automobile—and seen no more. In 1975 Hoffa disappeared. After his release from prison in 1971 Hoffa announced plans to recapture the Teamsters union presidency from Frank Fitzsimmons, a leader with whom the underworld had become most comfortable. The mob had little interest in Hoffa's return since he would probably be more demanding in dealing with them. 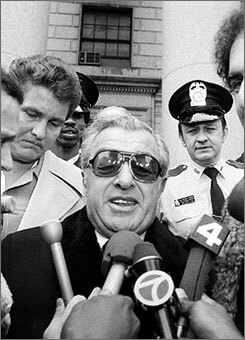 Provenzano, as the man in the East Coast Teamsters, was said to have warned Hoffa to go away on a number of occasions. It has been a police theory since Hoffa's disappearance that it was Tony Pro who ordered his abduction and secret execution. The charge has never been proved. On March 21, 1978, Briguglio, suspected of being a talker to the FBI, was shot on a New York street. Tony Pro was convicted after trial in Kingston, New York, in the Castellito matter. Both he and Konigsberg were sentenced to life imprisonment. Tony Pro died in prison of a heart attack at the age of 71.